Temperatures up to 10C below normal and sunshine down 60 per cent. Britain is at risk of being lashed by a once in 50 years storm, forecasters warned today, warning of a ‘major flooding event’ as Nasa released a satellite picture of a huge low sweeping in from the Atlantic. “Forecasters at the Met Office have already predicted 60mph hurricane-force winds will bring three months of rain over the next three days, making June the wettest since records began,” says this article in the Daily Mail. “Weather Channel forecaster Leon Brown said: ‘There’s a 50 per cent possibility of extreme downpours seeing over 80mm (3.1 inches)of rain in 12 hours in south and east Wales, which is a once-in-50 years event. “Overall, up to 110mm (4.3 inches) is expected in Wales in just over 48 hours to midnight Saturday. We all know that alarmists will attribute this weather to evil humans and their industrial shenanigans. Alarmists seem dim and followers,not leaders. Its sad,but when these co2 specialists see horrific climate change,towards freezing. Then,they have no option but believe,coolists say time is up,prepare or else lose ur gene pool. Well, Josh, let’s not let them have a free lunch. let’s fight back with our own commentary. What happened to the Great Drought supposedly due to sweep the U.K. from about mid-April 2012? Hmmm. Any chance they are related? I have said it before and I’ll say it again, if its not from the mouth of Joe Bastardi or Piers Corbyn its just rumor. But good luck to you folks over in jolly Old Blighty just the same. Seriously good luck. 3 months worth of rain in 3 days is nothing to sneeze at. —’Poem on the Evil Times of Edward II’, c. 1321. Thank you. I wasn’t aware of that. We’re trying to figure out what is wrong – and FIX it! looks like the swim and rowing teams will do well in the olympics,lots of water to practice in. My real concern is that within just a few years this years British weather will be warmer than the new normal. People will be begging the power companies to reopen the closed coal fired electricity generating plants. People will throw rocks at the likes of James Hansen and Al Gore. The reality of Global Warming (not) is on the way. Maunder Minimum type weather is not good for the British Isles. It is not good for all of Europe if they want to grow their own food. In the first decade of the 19th century people moved west and south from New England. They left New York, Vermont and New Hampshire for The Ohio, Indiana and Kentucky. The reason, frost in June and August. There was frost, actually a freeze in Apple orchards in NY this month, JUNE! A huge percentage of the crop was lost. A frost in August may mean no apples from the North East. A short growing season will make boiled tree bark soup sound pretty good. The last decade of the 18th century and the first two decades of the 19th century were considered the Dalton Minimum. It was bad then but not nearly as bad as the Maunder. If we are headed for a Maunder type minimum it will not be pretty. There are a lot of people in the world to feed, some may not eat well if they eat at all. Deep minimums like the Maunder tend to last nearly a lifetime. None of us today are likely to see the end of it. Get used to it and (move South), prepare for it. Do it now and you may be able to get something for your northern property, wait and just give it away when the snow stays until the end of June. I believe we’ll know for sure until the end of this year if the present grand minimum is of “Dalton” type or “Maunder” type. The similarities with Maunder seem greater though. If this confirms, we should have a drop in world average temperatures in the 2nd semester, similar to 2008. If it’s of Dalton-type this should not happen. It is a little off topic but Mount Washington on Vancouver Island is open for skiing this week end and they have a 1.5 meter snow base. Here is the link for anyone interested in checking it out. ‘The jet stream is currently meandering like a river to the south of the UK, steering wet and windy weather across England and Wales. At that time of the year, the jet stream is expected to have a more northerly track, steering the wind and rain towards northwest Britain, Iceland and Scandinavia. And this is the work of CO2 ??????? What about the Sun. Come on guys, my ex-husband (who is the font of all wisdom and knowledge) has sent me an article that totally explains how the Northern Hemisphere cold in the middle latitudes is caused by the extreme ice melting that is going on in the Arctic. Yes heat in the arctic causes cold in the US and Europe!! Someone preserve me from the true believers. The Arctic sea ice is melting more on the other side. The Greenland sea ice area is above normal. East Siberian Sea, Chukchi Sea and Beaufort Sea are below normal. Also, the rain clouds arriving from the west side (north Atlantic) passing north of Spain,France and Germany. The spiral (anti clock wise) is centered over the Irish sea. The two recent CMEs are reaching Earth about Sat 16th June and Piers Corbyn reckons that these accentuate weather events. Here in the Blue Mtns outside Sydney we usually see only a few mils of rain in June but this winter has been wet in regular episodes with one notable storm. I’m tempted to run with the Corbyn version of events and see how it fits with reality. The reality is that where the really heavy rain fell wasn’t in drought. Where the drought is the rainfall was significant but by no means unusual. 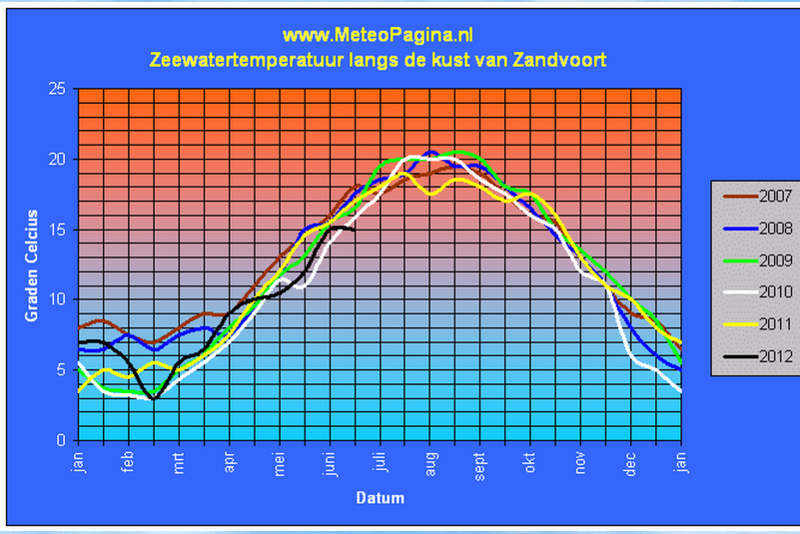 The temperature of the Dutch coastal water (North Sea is just 15°C. That is 3°C colder than in 2007. The seawater hasn’t been this cold in june in the last 5 years. Oops. What happened to their forecast? Lets’ see, Houston had over 5 inches in some areas because of a largely rain event, nothing to do with a tropical depression or tropical storm several times in the last three years. It is not out of the norm to have 3 to 5 inches in several days just from summer thunderstorms if you have training effects(repeated storms over the same areas). So what is so cataclysmic about this???? I wish some of that cooler weather would come down to southeast Texas. While we aren’t baking in drought like last summer yet,(we are actually having some some what regular rain) the heat has been on since the beginning of May. And after the year without a winter, a much warmer that average spring, where is the so-called cooling???? What happened to this storm? I have endured gloriously sunny weather for several days now albeit with moderately strong winds and intermittent cloud. Storms like this I can live with – bring them on!